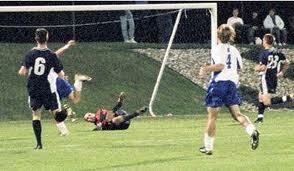 In Elizabethtown College Soccer History it has been eulogized as “The Game”! The year before Elizabethtown College battled Hartwick College for the Division III NCAA National Soccer Championship to a nil-nil tie after six overtime periods. To prevent another tie when they met for a rematch for the National Division III title again, they started the game an hour early, just incase history would repeat itself. It did! When regulation play ended, neither team had put the ball into the goal for the second straight year. In the fifth overtime period, during an offensive attack by Hartwick the Etown goalie was drawn out from his net and a Hartwick attacker fired a thunderous shot taking the breath out of every Etown fan. A sigh of relief was replaced by thunderous exaltation when big Dale Beiber, the son of an African missionary, placed his enormous thigh in front of the ball, knocking it down, and then kicking it down the field to safety. After playing 90 minutes of regulation play, and 5 ten-minute overtime periods, every player, exhausted, was running on pure adrenaline. Each team was looking for the “break” that would tip the scale. That came when Sandy Kilo, the shortest player on the field, drew the Hartwick goalie out of his goal on a break away, and lobbed the ball gently over his head into the goal! 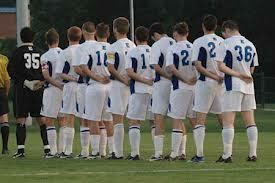 Elizabethtown won 1-0! A front page pictorial of their victory lap on the Etownian, the official weekly Elizabethtown College paper, recorded history. Why did Etown win? They were in phenomenal physical shape which provided the stamina needed and one-third of the student body weathered the 7 hour trip to create a “home game” atmosphere . Months earlier, before the student body arrived for the fall semester, the team had extensive two-time a day practices and drills. I recall one soccer player’s return from the late afternoon practice, where he took off his soccer spikes and collapsed on the hard stone porch, falling a sleep there in spite of the student traffic throughout the evening. Those exhaustive practices prepared the team for the stamina needed later. I also was part of the masses who crammed into any vehicle heading towards New England for the game and the long, joyous, return home before the team bus arrived for a victory celebration like the College had never experienced before. Elizabethtown had been better “equipped” for the game. They had invested their time in physical conditioning, had worked hours upon hours on their soccer skills, had worked hard on developing a “team” concept, and had built a radical fan base that would travel anywhere to support them. They were prepared; they were equipped. We, the Church, can learn from their experience. We should be “equipping the saints for works of service.” “Prepare ye the way!” is the cry heard throughout the Bible. Preparation always precedes ministry. Jesus prepared his disciples for when he would leave the earth: he prepared them for apostleship; he prepared them to be the foundation of this new movement, the Church. He not only prepared them, he equipped them with the Holy Spirit to “teach them all things”; he equipped them through the Word; he equipped them by teaching them the principle of laying down your life for your brethren (IJohn 3:16) so that they would establish community, a community that would survive even the most brutal persecution possible. Preparing and equipping were essential principles needed in birthing and establishing the Church. They are still needed today in the maintaining of the Body of Christ, the Church. Any good building needs a foundation and needs the proper equipment to build that foundation. God knows what foundation the Church needed and equipped the Church with evangelists, shepherds, teachers, prophets, and apostles. I personally believe that evangelists, shepherds, teachers, prophets, and apostles are still currently in most churches, but we need to equip them for service, then release them to do the calling they have been prepared and equipped for. The more we prepare them, the higher we raise the bar for success, the more effective the Church will become. Instead of dead-beat Christians who are enabled by a professional staff, we need to develop a new mindset of how to prepare them, equip them, and release them for works of service. Life sometimes seems as exhaustive as a six overtime period soccer match, a tug of war, back and forth free-for-all that we can only win if we have been properly prepared and equipped. Like the terrific fan support, the Church needs to rally around each other as a community of faith, of believers, as priests unto the Holy Spirit, who are willing to “lay down our lives” for one another. When that occurs, the Church will be ready to obtain that definitive score that will win the match, or “The Game” of “life”.